From left, Barry Brown, University Professor of exercise science; graduate student Leigh Jurney; graduate assistant Marcos Michaelides; and graduate student Koulla Parpa. Bud Thompson returned from training at the Cooper Aerobic Clinic in Dallas with a troubling question: Why are men who work as firefighters likely to die 10 years earlier than the average man? As a battalion chief in the Fayetteville Fire Department, he was well aware of the physical demands of his profession, but in Dallas he had learned that the male firefighters on his crews are prone to premature death. The data that produced this dismal prognosis didn’t include the work-related injuries that led to death. Nationally, the number one cause of death for firefighters is heart attack, and occupational stress is a recognized risk factor for heart disease. Thompson sat down with professor Barry Brown to discuss what he had learned and asked him what he could do about his firefighters’ increased risk of heart disease. Brown, a University Professor of exercise science with 35 years of experience in fitness testing and exercise prescription, learned that the stress firefighters face is unlike the everyday stress of most working people. “On top of the incredible physical demands, firefighters know that an alarm may sound at any moment, requiring them to perform at maximum capacity to save lives,” he said. In Thompson’s question, Brown saw an opportunity to apply his experience in reducing stress and enhancing athletic prowess to the life-and-death performance demanded of firefighters. As a teacher, he also saw an opportunity to engage his undergraduate and graduate students in a challenging and meaningful project. Thompson’s simple question, combined with the expertise and dedication of a team of UA faculty and students, grew into a research and service project that has the potential to improve the lives of firefighters throughout the United States. In the months after talking to Thompson, Brown and his graduate students conducted an initial study in spring 2003 with 21 volunteers from the Fayetteville Fire Department. They recognized that the physical demands of a firefighter’s job are similar to those of many sports – strength, flexibility, endurance and power – and developed a training program to improve these attributes. Brown knew from his experience with athletes that, while genes determine much of human physical capability, people can improve their fitness measures by up to 40 percent with a carefully planned program. Based on this initial study, the Federal Emergency Management Agency provided $105,000 to fund a year-long training program for the entire Fayetteville Fire Department. To conduct the testing and training of more than 60 firefighters, Brown relied on a team of graduate students – Koulla Parpa, Leigh Jurney and Marcos Michaelides – and the participation of undergraduates in an exercise science class. The research team started with a physical fitness questionnaire administered to all firefighters to screen for those who needed further testing or a medical examination and to identify those psychologically ready. The researchers used Prochaska’s five stages of change, a system for determining readiness to change that has been used in treating tobacco addiction, to assess the firefighters’ awareness of and commitment to a potential fitness program. Prochaska’s system divides the change continuum into stages designated as pre-contemplation, contemplation, preparation, action and maintenance. As the program progressed, the researchers guided firefighters in moving from the pre-contemplation level of awareness of a problem without a plan for change, or the contemplation level of thinking about change, to an action mode involving considerable commitment of time and energy. The research team designed a three-month program of strength and power training involving monitoring of the firefighters as they engaged in regular, vigorous exercise and conditioning. Firefighters were tested frequently to chart progress. The goal was to learn whether specific weight-training and conditioning combined with information about nutrition and stress-reduction could reduce the incidence of stress in firefighters. To make a commitment to action, the firefighters needed to develop trust in the researchers. Parpa and Michaelides remember what it took to bring the firefighters into eager participation – results. After only a couple of weeks, the first group of firefighters began to notice results. With that, Michaelides said, they wanted to come into the gym more often than required, and Parpa found that these firefighters began to influence the rest of their co-workers to embrace the program. They began calling Jurney to confirm the next training session. Michaelides, who has lifted weights for over seven years, admitted it took him some time before he looked forward to working out. He was impressed with the firefighters’ commitment – no one skipped a session, and they always arrived on time. Brown describes the rapport the firefighters developed with the students as being similar to an athlete and coach relationship. Firefighters have expressed disappointment when student trainers graduate and leave the program. When Parpa and Michaelides visited their families in Cyprus, firefighters were concerned about their progress, because an important part of their motivation was on the other side of the world. At the end of the three-month research and training program, firefighter Jerry Kelly discussed his participation. He noted that as the city of Fayetteville grows, so does the size of new buildings, which increases the physical stress of an already stressful job. Although he has always worked on being physically fit, he was able to increase his time on the step mill stress test by two minutes in his first three months of training. Joe Scheyder, captain of Fire Station 2, described himself as the oldest person in the group. It had been years since he had worked out, and after three months, he had “a huge increase” in strength and stamina. When he promoted the program to his crew, they all signed on. There was a lot of interest in his fire station in the new equipment, treadmills and weights. “This program is state-of-the-art as far as the country goes, not to mention the state of Arkansas,” Scheyder said. Michaelides learned first-hand about the routine stress firefighters face when he participated in a training exercise that involved entering a burning building. He put on the suit, hooked 60 pounds of equipment onto his body, and went inside, where it was so hot that his helmet began to melt. 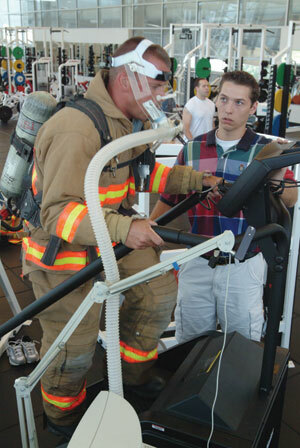 During that training session, researchers measured the heart rates of the firefighters. All were alarmingly high. The heart rate for one, who had just left the burning building, tested at 200 beats per minute. It is this level of stress, coupled with the uncertainty of when they will have to perform, that some researchers have suggested as an explanation for the premature death rates of firefighters. After analyzing the assessments, the researchers divided the firefighters into three groups, one for strength and conditioning, another for power-training and the third as a control group that could continue whatever they had been doing. All groups were tested to determine the maximum weight each one could lift. The strength-training group worked out at 70-80 percent of maximum, using lighter weights and more repetitions than the power-training group. For the power-training group, the weights were increased to 85-95 percent of maximum with fewer repetitions. It was difficult to maintain a true control group, however, since half-way through the program, firefighters in the control group saw the changes in their co-workers and began to increase their own workouts and activity levels. The wellness component included presentations by exercise science undergraduate students about stress reduction, risk factors for heart disease, and obesity and eating habits. Jerald Foote, assistant professor of nutrition, provided individual counseling to develop nutritional programs aimed at enhancing performance. Ed Mink, director for health promotion with the University Health Center, talked with the firefighters about strategies for handling stress. Some of the preliminary results were what Brown and Jurney expected. For example, they looked at the resting blood pressure rate and the level of oxygen used at maximum effort – known as the VO2 max level – that was measured during a stair-climbing test. For those whose resting systolic blood pressure rates were lower, the VO2 max levels were higher, indicating that the training had effectively increased the capacity for exercise with less stress on the body. They also saw overall increases in strength in tests of the lat pull, the bench press and the leg press. Body fat levels had decreased. Preliminary results also showed something unexpected: there was a significant difference in the firefighters’ response to physical and emotional stress. To understand firefighters’ stressors, Brown and Jurney measured cortisol levels present in saliva that was collected at various times during the day. Cortisol is a steroid hormone produced by the adrenal glands that helps regulate blood pressure and cardiovascular function, as well as the body’s use of carbohydrates, proteins and fats. Cortisol secretion increases with any stress to the body — either psychological or physical, such as an injury, illness or exposure to extreme conditions. The researchers collected saliva samples each morning and night for baseline levels, then collected again when firefighters were at rest, immediately before they left the station on a run and immediately after they fought a fire. The researchers then tested the cortisol levels present in the saliva to determine if the firefighters were experiencing chronic continuous stress and what effect the training was having on stress levels. All firefighters, experienced and rookies, showed elevated cortisol levels after the physically challenging stair-climbing test. For this test they wore 60 pounds of gear and a bulky, fire-retardant suit and, as typically competitive individuals, pushed themselves to continue climbing almost to the point of collapse. 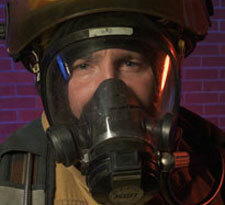 After the test, cortisol levels were high for all firefighters, experienced and rookie. But, results were different in the firehouse after an actual run. In this case, the cortisol levels soared higher for rookies than for experienced firefighters. Brown believes the difference is an indication of emotional stress. While all face the same physical stress while fighting the fire, experienced firefighters seem to have a better idea of what to expect when the alarm sounds and the trucks roll. Brown and Jurney believe that the stair-climbing test they used is relevant to the particular physical demands made on firefighters and thus can isolate physical stress response. They suggested that further research is needed, particularly with rookie firefighters, to examine factors involved with emotional stress. Brown also noted that recent research has examined the effects of inflammation on heart disease, which suggests that testing for C-reactive protein (CRP) to measure the level of inflammation in the body might yield valuable information. After completing the first three months of research that assigned firefighters to groups, Parpa is working with exercise science student trainers to develop individualized training programs for each Fayetteville firefighter. They hope to match fitness plans with individual interests to encourage long-term maintenance of exercise habits. She is emphasizing aerobics with some weight training, particularly for those firefighters who need to lose some weight before taking up vigorous strength or power training. The trainers will work with firefighters so they can perform testing on their own as they work out. To measure body fat, they can use new equipment provided in the fire stations that is similar to the body fat analyzers used by the university researchers. They also will begin logging sit-ups and push-ups, tests that aren’t useful in research but can give a picture of progress and aid in motivation. Brown hopes that when FEMA and local governments see the impact of the Fayetteville Firefighters Wellness Program, they will fund an ongoing program for firefighters. Brown envisions a National Firefighters Life Improvement Center serving mid-sized fire departments nationwide. 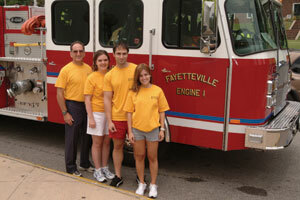 As a step toward this goal, the university and the Fayetteville Fire Department presented the first Firefighters Professional Wellness Certification Workshop in February 2005. They brought together firefighters from Arkansas, Missouri and Oklahoma to learn strategies to reverse premature death and illness from cardio-vascular diseases and to enhance performance and morale. After passing written and practical examinations, the 18 participants earned continuing education credits from the UA Center for Corporate and Employee Wellness and the American College of Sports Medicine. They are certified to conduct health and fitness programs in their hometown fire departments, and will receive periodic newsletters to assist them. Several firefighters from the Fayetteville Fire Department were certified, and Parpa will be working with them through December 2005 as they begin training their co-workers. Brown presented the results of the pilot study at the World Sport for All Congress in Rome, Italy, in November 2004. The congress, organized by the International Olympic Committee in collaboration with the World Health Organization and the General Association of International Sports Federations, brought together 843 scientists, trainers, physicians and coaches from 103 countries. There was a good response to Brown’s presentation – including a Romanian scientist working with firefighters and a researcher from Vienna studying electrolyte replacement – and he foresees international cooperation with future research. Brown credits the foresight and support of Thompson and Fayetteville fire chief Chris Bosch with making the Firefighter Wellness Program possible. While he never underestimates the potential this program holds for improving fitness, reducing stress and saving firefighters’ lives, he also sees other important benefits. “The real success of this study is the relationships between the students and the firefighters,” Brown said. “The real, deep concern our students have when they work with firefighters is the basis of success for the entire program.